Wellsboro inducts Hall of Fame Class of 2018. The Wellsboro Hornets Sports Booster Club and the Wellsboro Athletic Department held their 3rd annual Hall of Fame induction ceremony at halftime of the Wellsboro vs. Montgomery football game on Friday, September 7. Making up the Hall of Fame Class of 2018 are athletes Dale Tombs, Derek Harsch, and Russ Manney, III and coach Russ Manney, Jr.
"I'm very humbled by this honor. I played sports here and never thought of anything like this, I just loved the game at an early age. My parents let me play sports and I took it from there and fortunately had some great teammates that I played with. It's just awesome." "It means the world, I didn't really expect it. I wouldn't really say I had a good career because I just went out there and had fun every weekend with my teammates." Manney, III (football) was named the NTL's "Offensive Player of the Year" and "Player of the Year" during his senior season in 1995 as he rushed for 1,351 yards, averaged 7.7 yards per carry, and scored 20 touchdowns. The Hornets finished the regular season 9-1 that year, and Manney was a 1st team All-Twin Tiers selection and District IV All-Star. In wrestling, Manney was two-time sectional champion and competed at districts all four years in four different weight classes. In track, Manney won eight District IV Championship medals and won the 110m hurdle District title in 1995 and participated in the PIAA State Championships in the same event. Manney went on to be named Outstanding Offensive Player in football, Outstanding Wrestler, and Track Athlete of the Year at the annual WHS Athletic Awards ceremony, while also being named the Male Athlete of the Year. "It's an honor, it's a privilege and when I got the news I was really excited. Just to come from Wellsboro, where I'm at now and what it meant to be here tonight and see all these people, and I'm back to where it all started. It's been 22 years since I've been to a game so this is just real special to see the facilities and how things have come. I think all of us through the years, with Derek and my father especially, have left our mark on this and I'm glad the community supports this beautiful place." Manny, Jr (coaching) is currently Wellsboro's all-time wins leader in football. After being an assistant coach with the Hornets during the 1973-77 seasons, Manney became head coach of the Hornets in 1985 and coached until 1997, then later returned for another two years in 2001 and 2002. During that time, Manney won 66 games, with his best season coming in 1995 when he guided the Hornets to a 9-1 regular season record. In 1999, Coach Manney was inducted into the Bernie Romanoski Chapter of the Pennsylvania Sports Hall of Fame, and in 2012 he was inducted into the Tioga County Chapter of the Pennsylvania Sports Hall of Fame for his high school athletic achievements and his coaching successes on the gridiron. 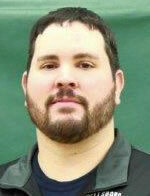 During his tenure at Wellsboro, Coach Manney also coached wrestling, track, and strength training. He also founded the Wellsboro Gridders Club in the early 1990's. "I've been here for over 40 years now and my career started at Wellsboro as an assistant coach and just the people and the community, I'm just thrilled that the committee selected me. This is only the third time they've had this and I just appreciate what they've done and I look at the facilities and see how everything has changed. To be inducted into this is a special moment for me, it's more of a special moment when I get inducted with my own son. I really appreciate that and Derek, I had the opportunity to coach him during his 2,000-yard season, it's just a great situation and I appreciate it so much." WellsboroAthletics.com would like to congratulate all of the members of the Hall of Fame Class of 2018. Nominations for the Hall of Fame Class of 2019 are now open, running from now until January 1, 2019.